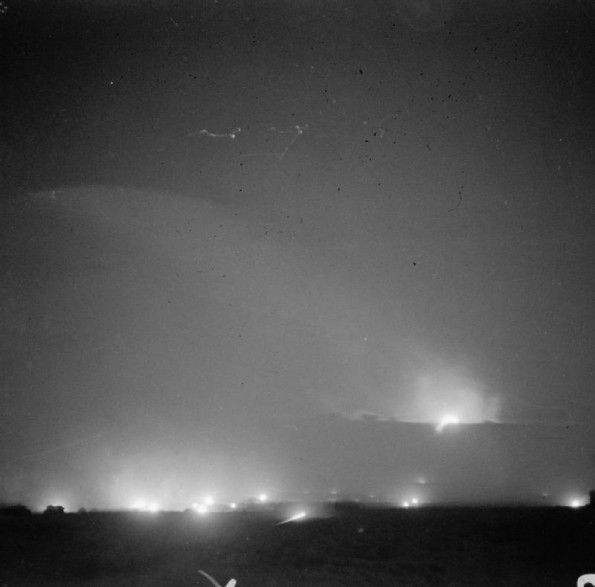 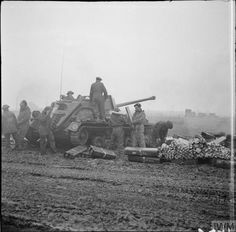 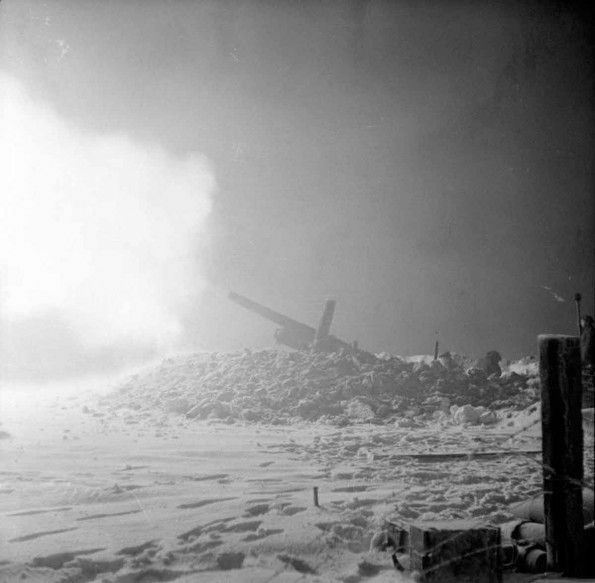 Archer 17-pdr self-propelled gun firing in support of infantry of 15th ( Scottish) Division during the attack on Goch, 19 February 1945. 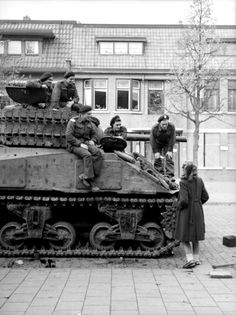 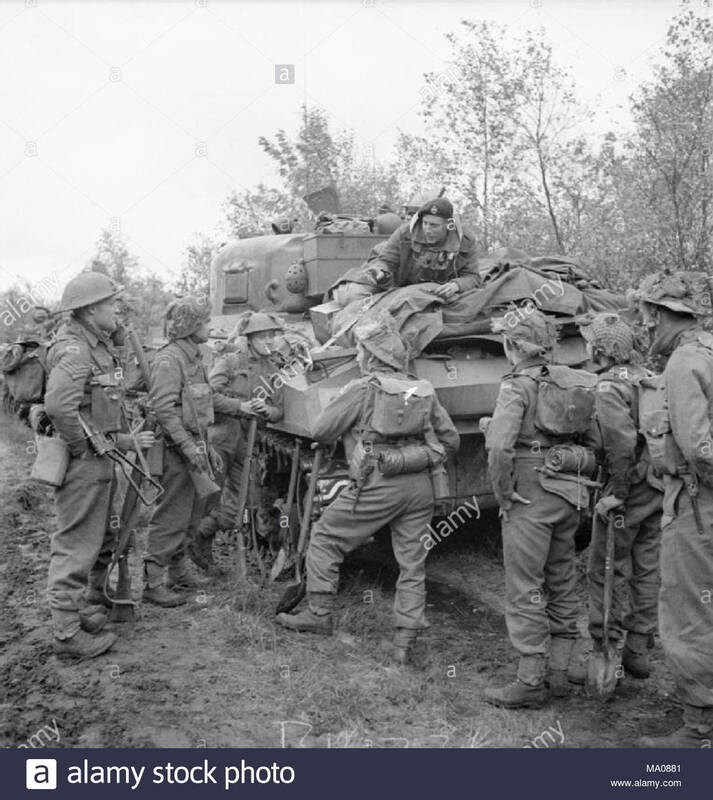 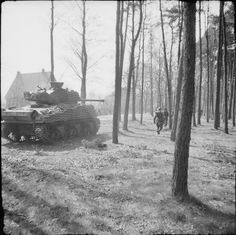 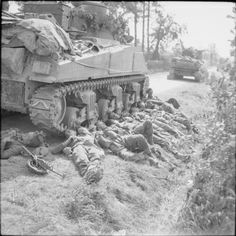 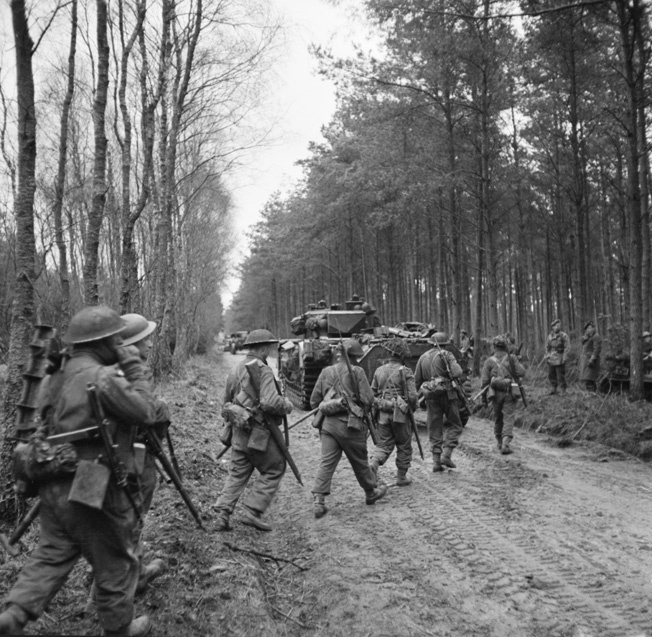 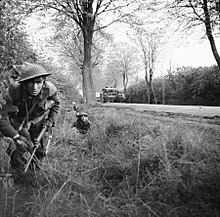 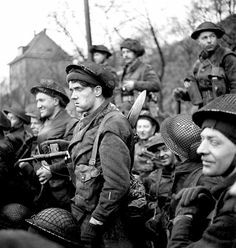 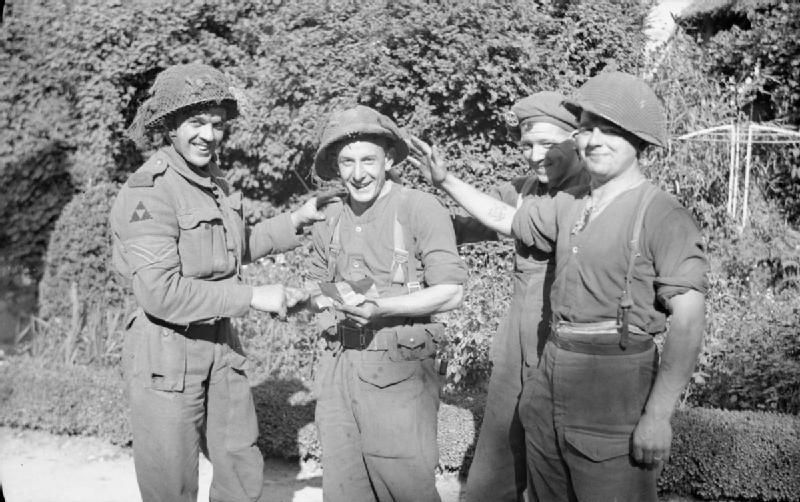 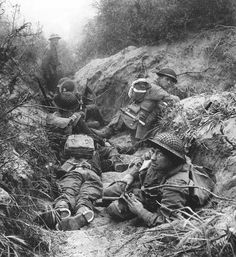 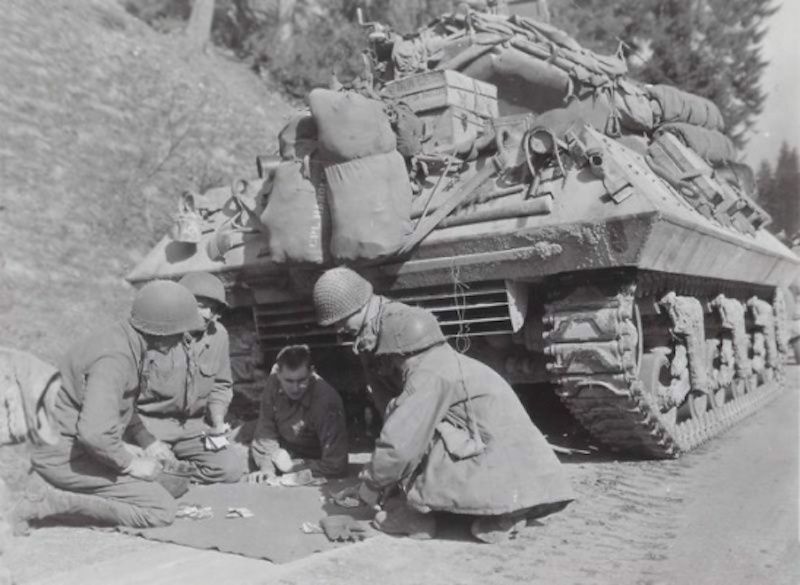 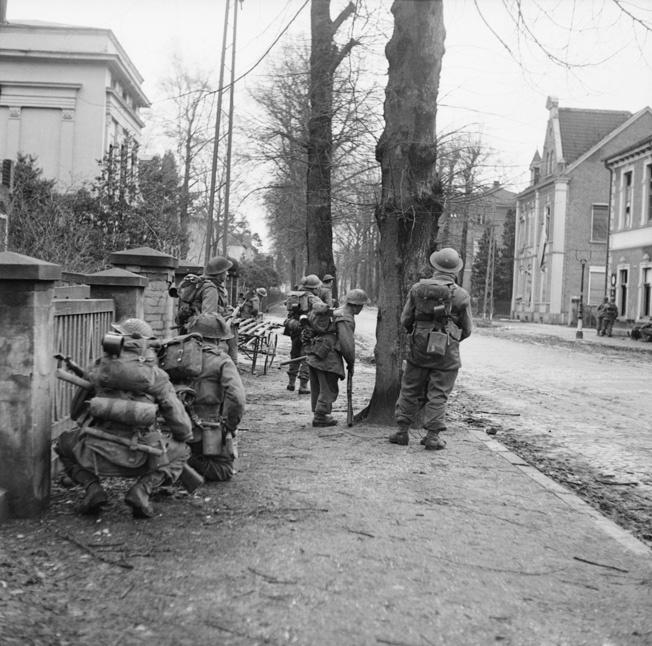 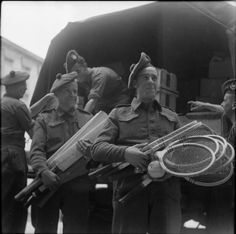 Universal Carriers and infantrymen of the 8th Battalion, Royal Scots pause during the attack by 15th (Scottish) Division on Tilburg, 27 October 1944. 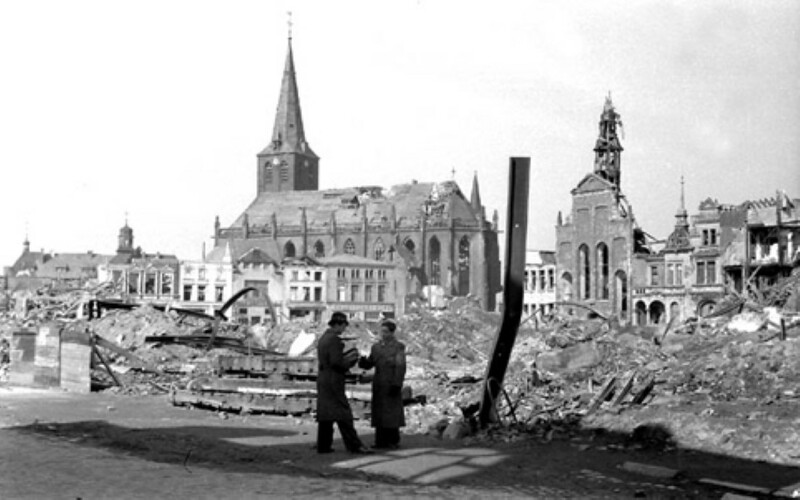 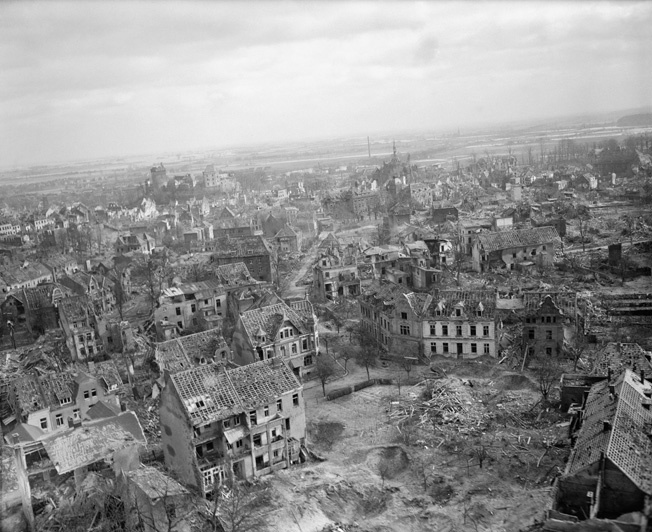 Maria-Magdalena kerk on the severe damaged market place of Goch. 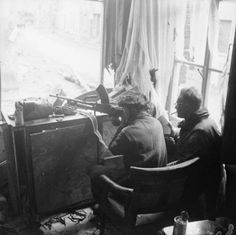 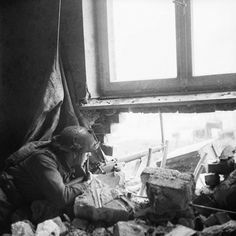 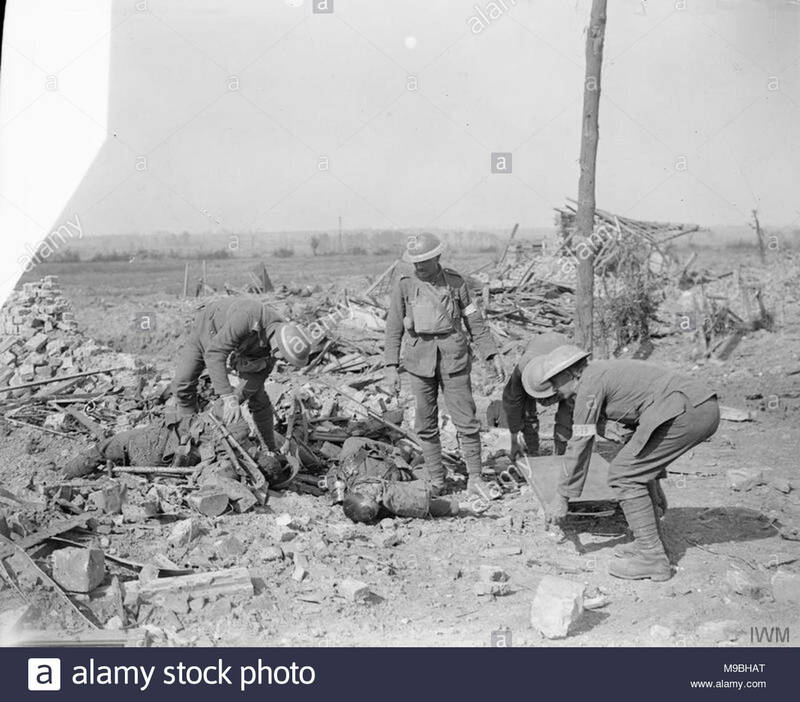 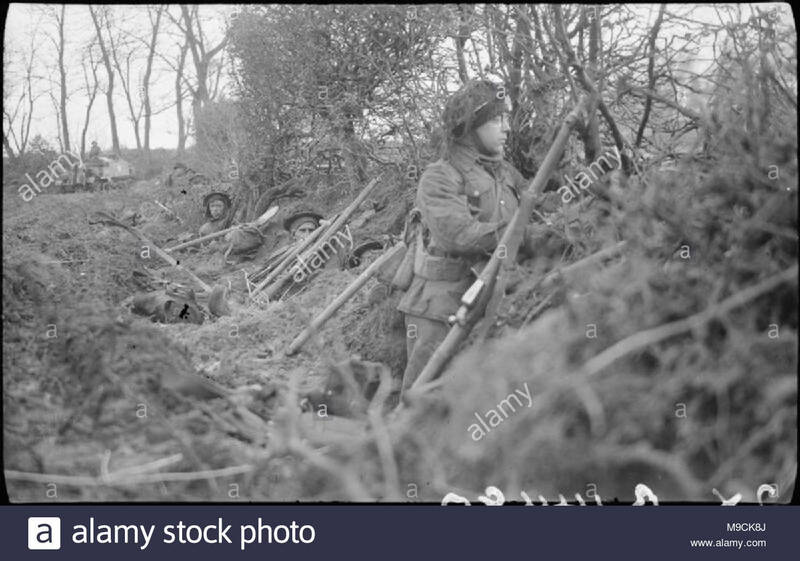 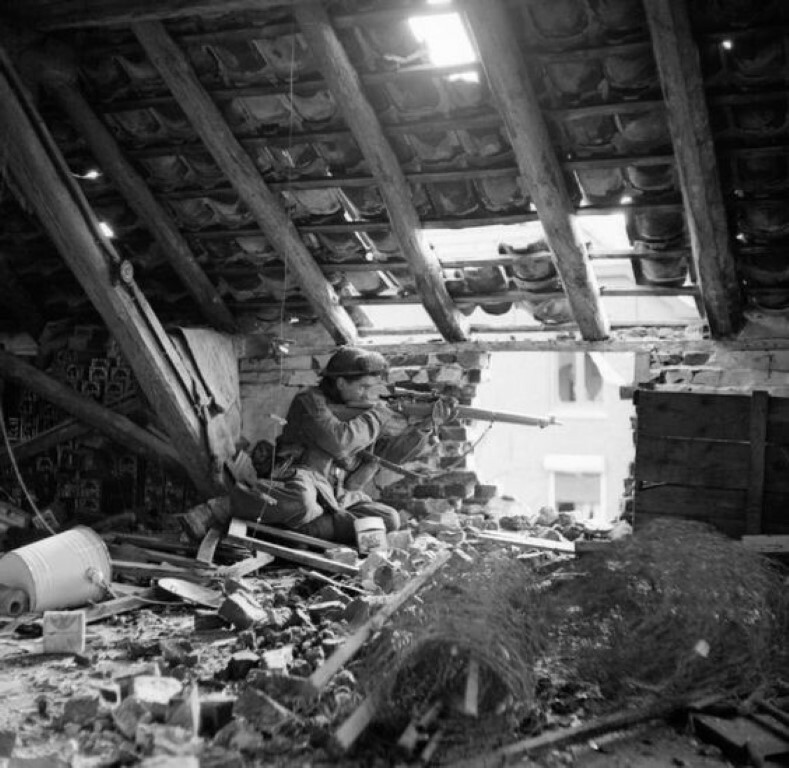 A sniper 'C' Company, 5th Battalion, The Black Watch, 51st (Highland) Division, in position in een destroyed building in Gennep, 14 February 1945. 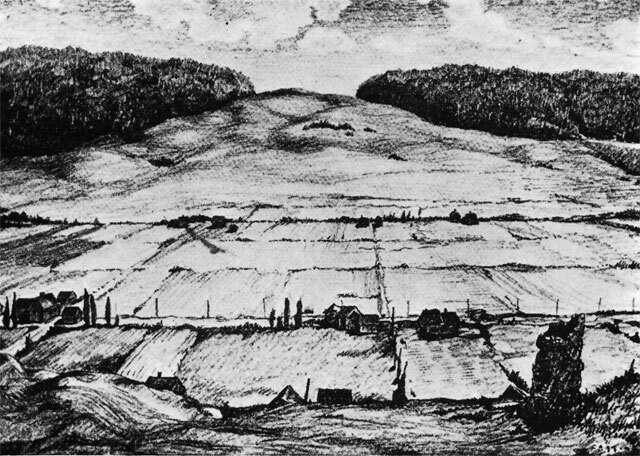 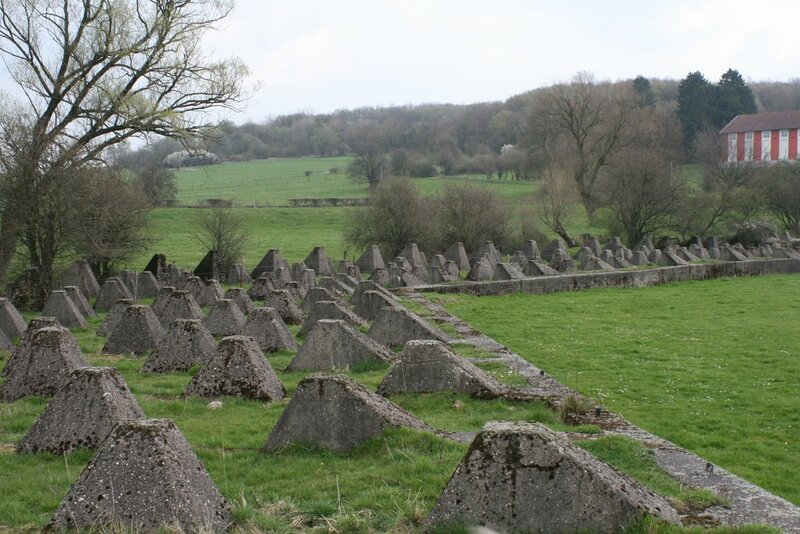 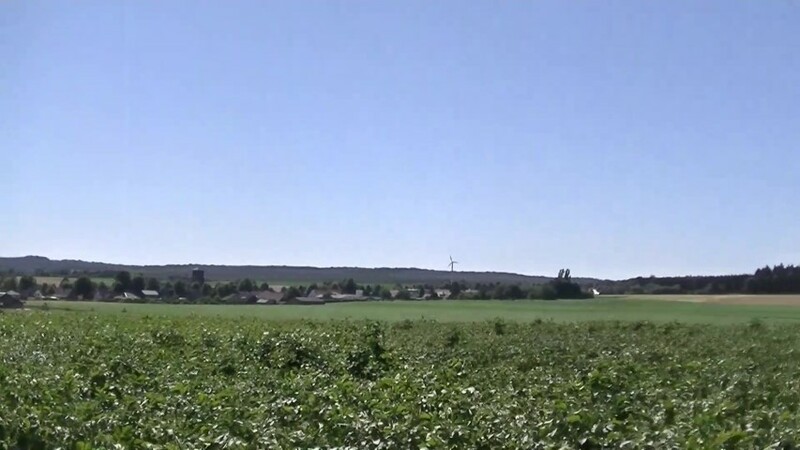 Our first point of discussion was at the point where we had a view of the village of Nütterden, where the spur of the Siegfriedlinie was located. 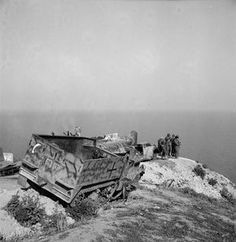 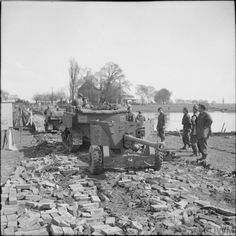 IWM B 14830: Humber F134057 named "Laughing Boy III", A Squadron, 2nd Troop, 53rd (Welsh) Recce Regiment RAC, near Goch, Germany, February 1945. 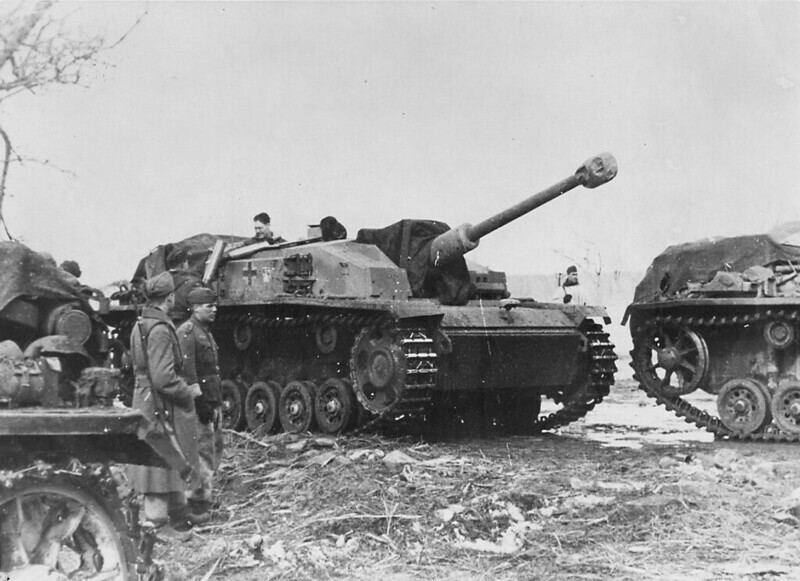 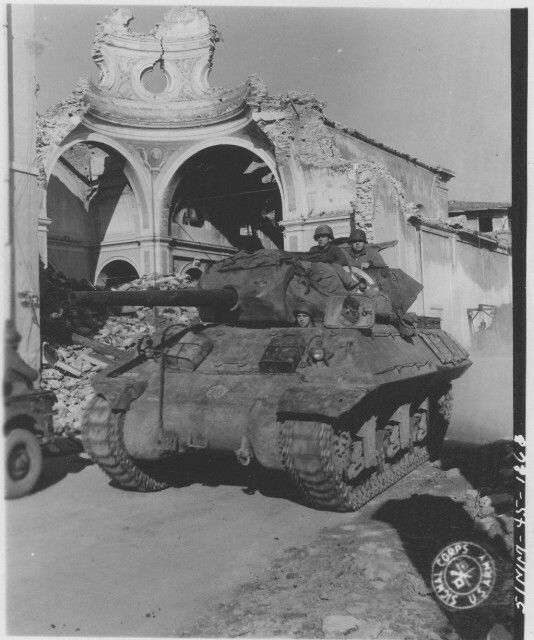 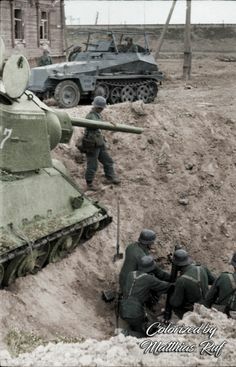 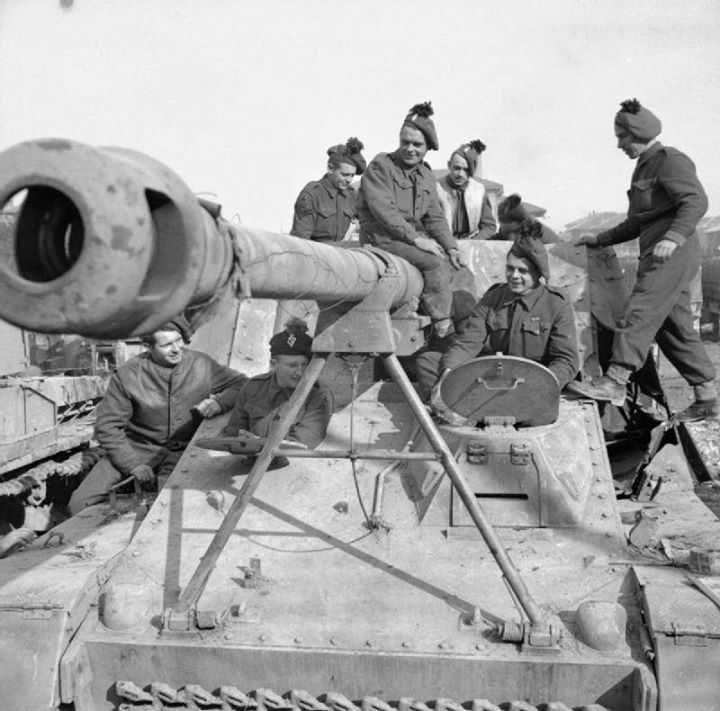 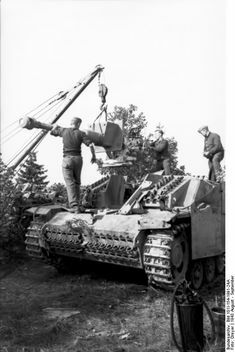 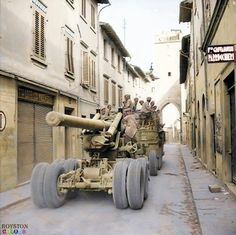 Troops clamber over a captured German 'Hornisse' 88mm self-propelled gun at an exhibition of enemy equipment in Forli 30 January 1945. 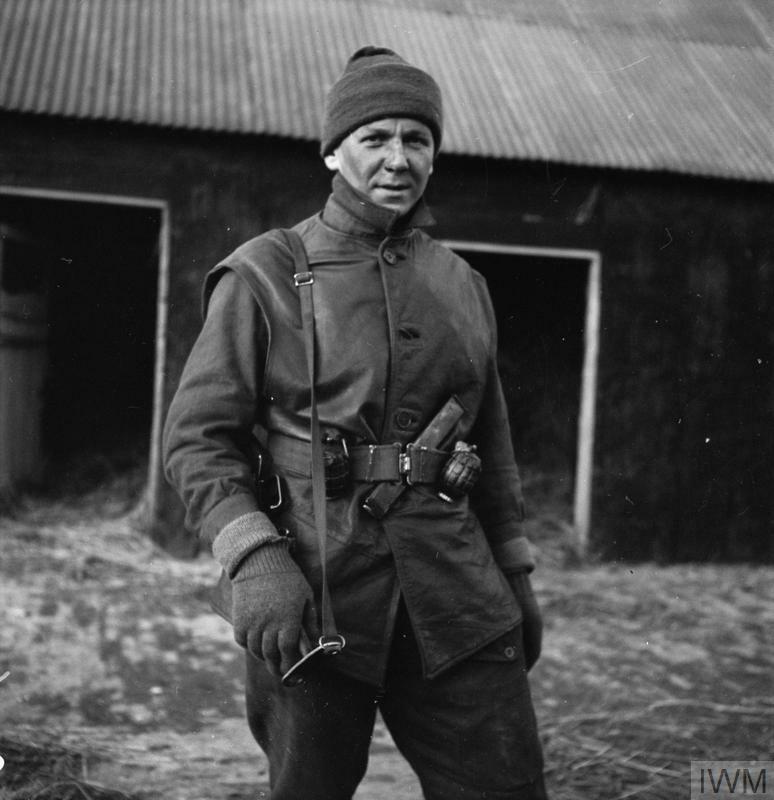 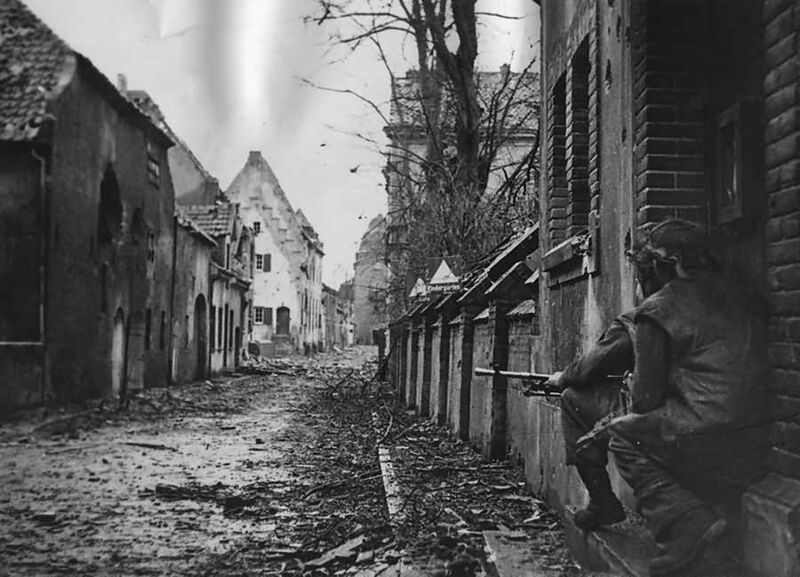 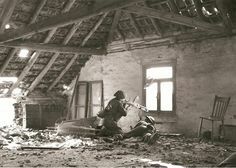 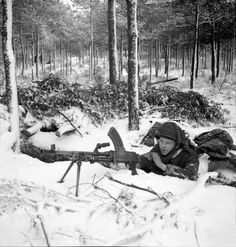 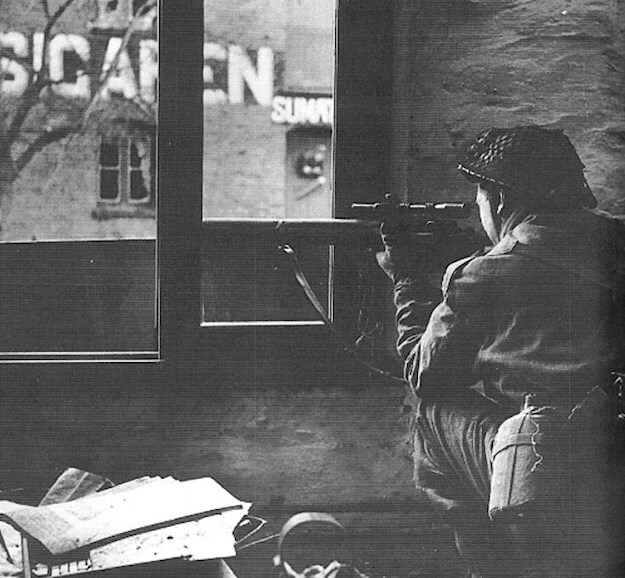 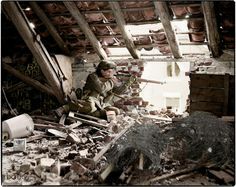 A sniper from "C" Company, 5th Battalion, The Black Watch , 51st (Highland) Division, in position in a ruined building in Gennep, Holland, 14 February 1945. 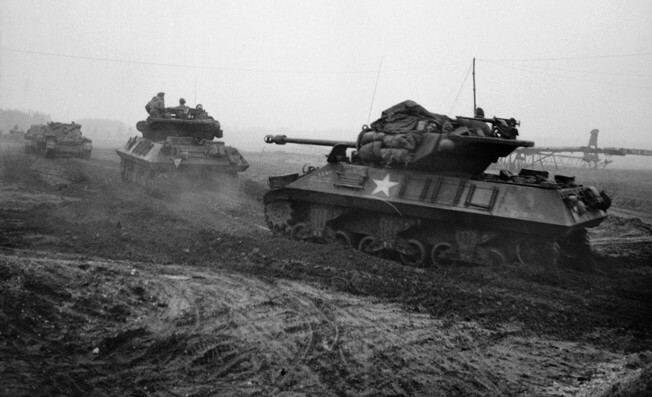 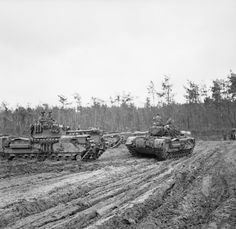 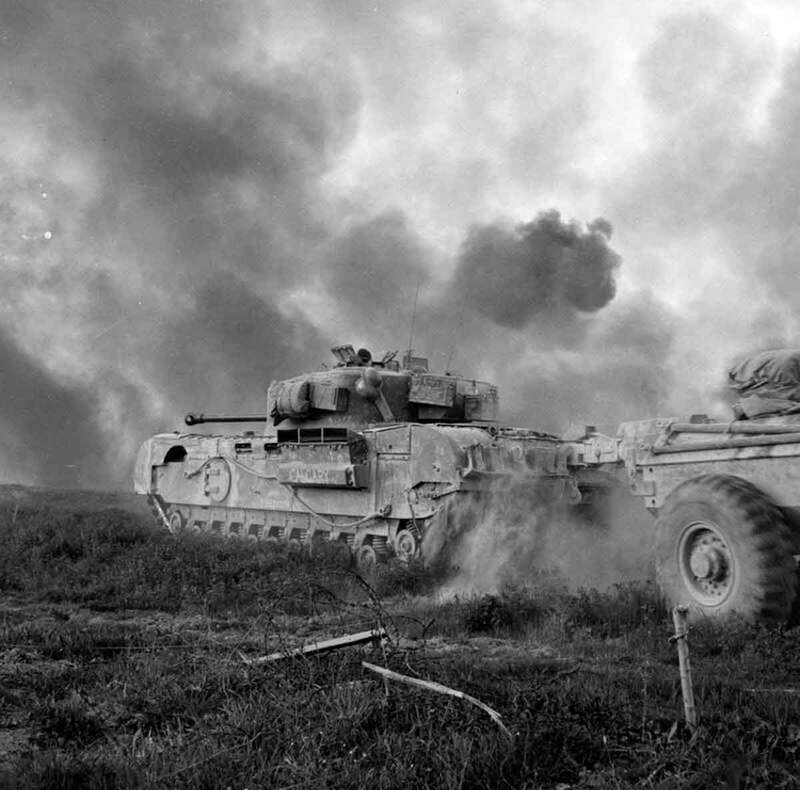 Churchill tanks of the 107th Regiment RAC (King's Own), part of the 34th Tank Brigade, at the start of the Reichswald battle, 9 February 1945. 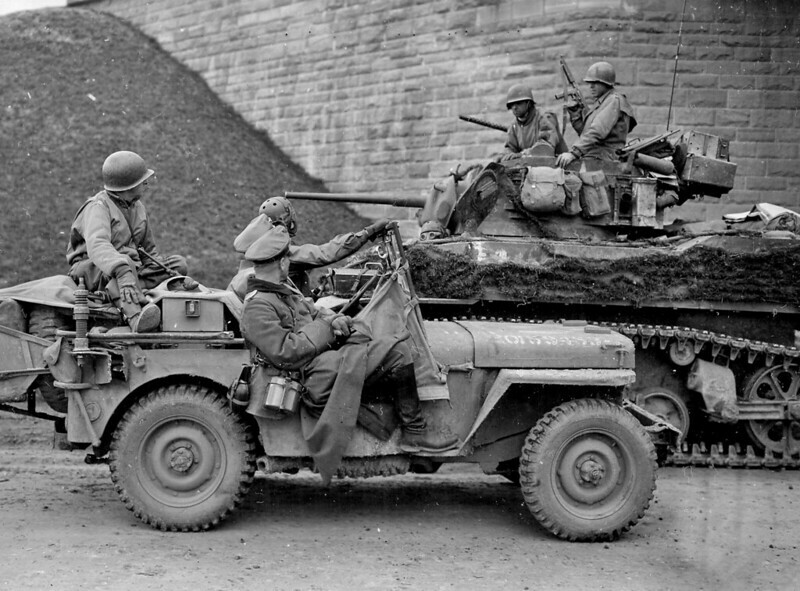 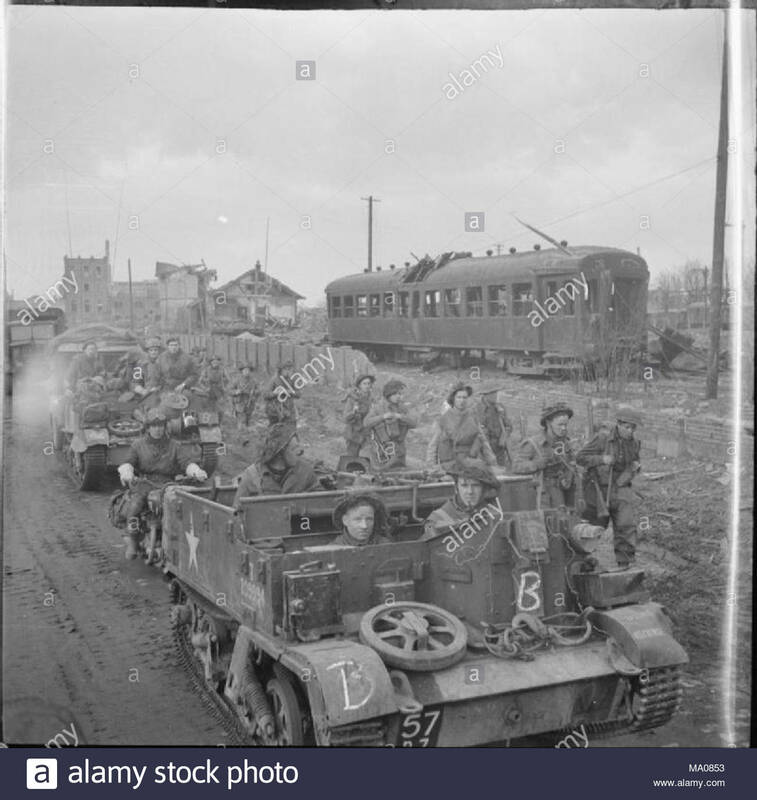 Jeep with officers of the Wehrmacht a prisoner along side a M5 Stuart tank of the United States in the town of Hersfeld, Germany 31st March 1945. 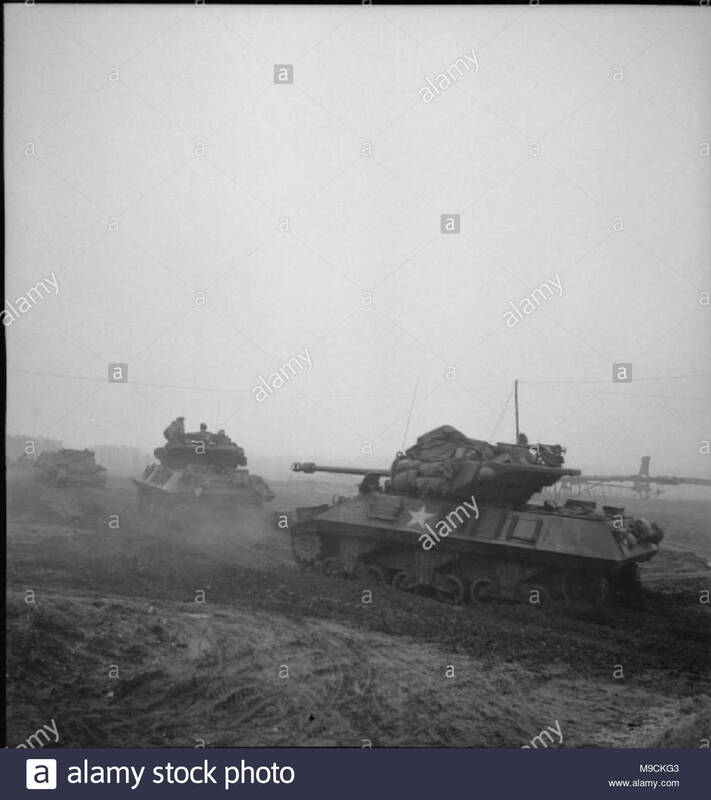 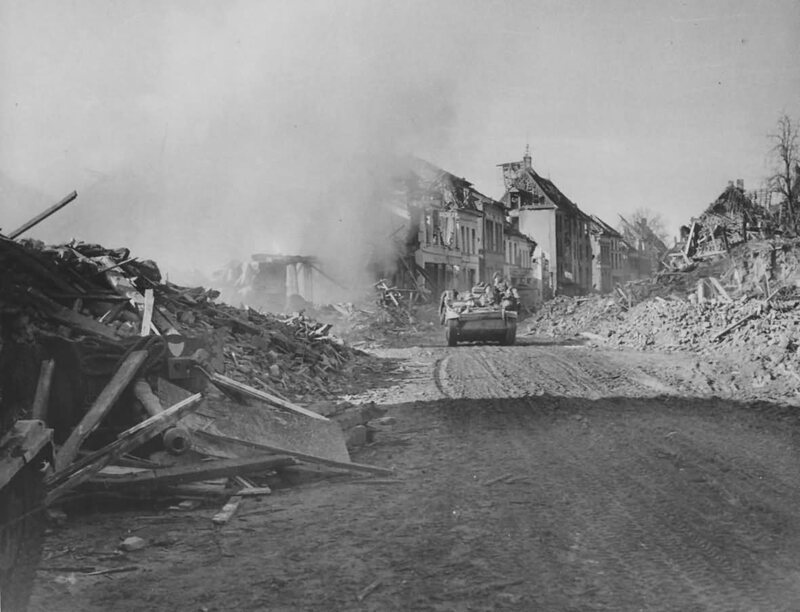 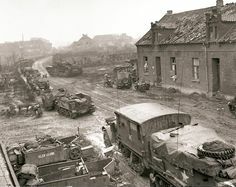 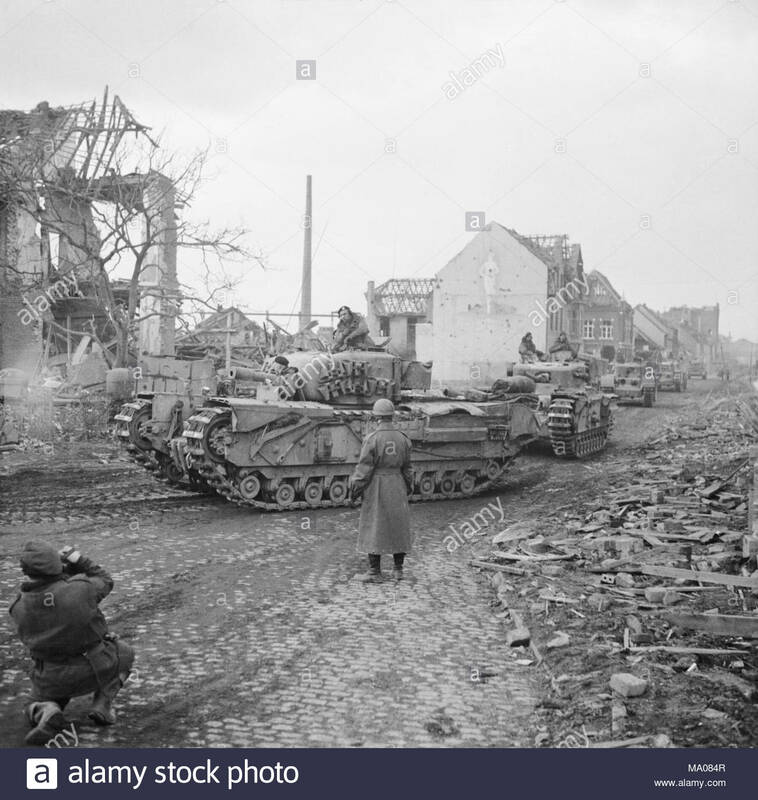 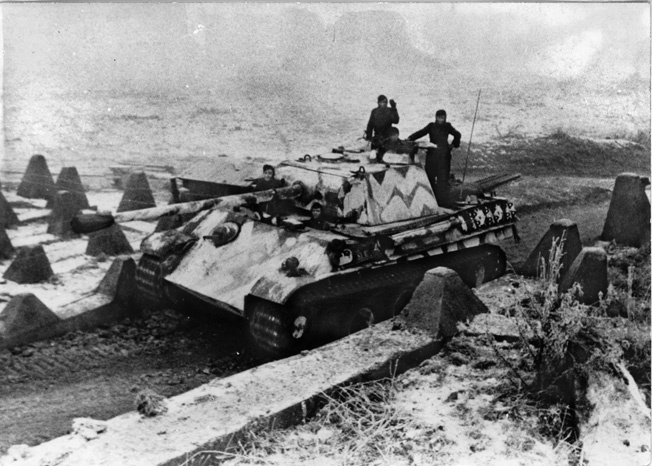 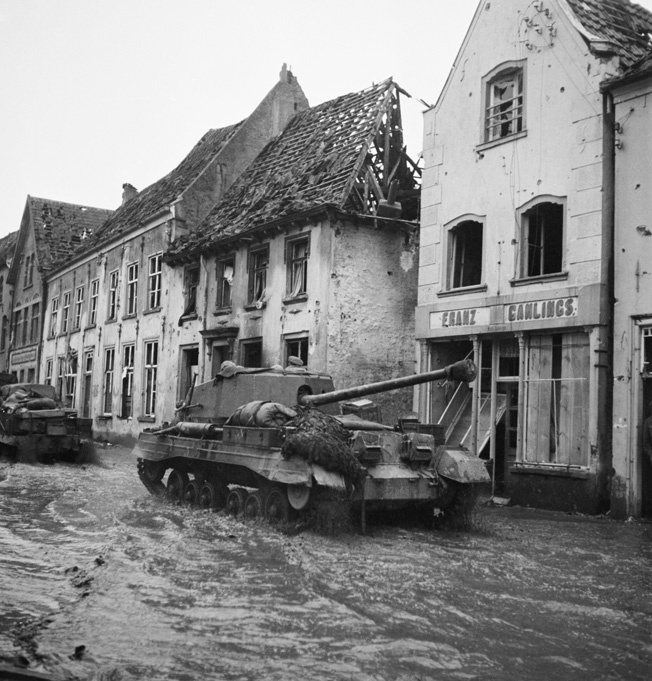 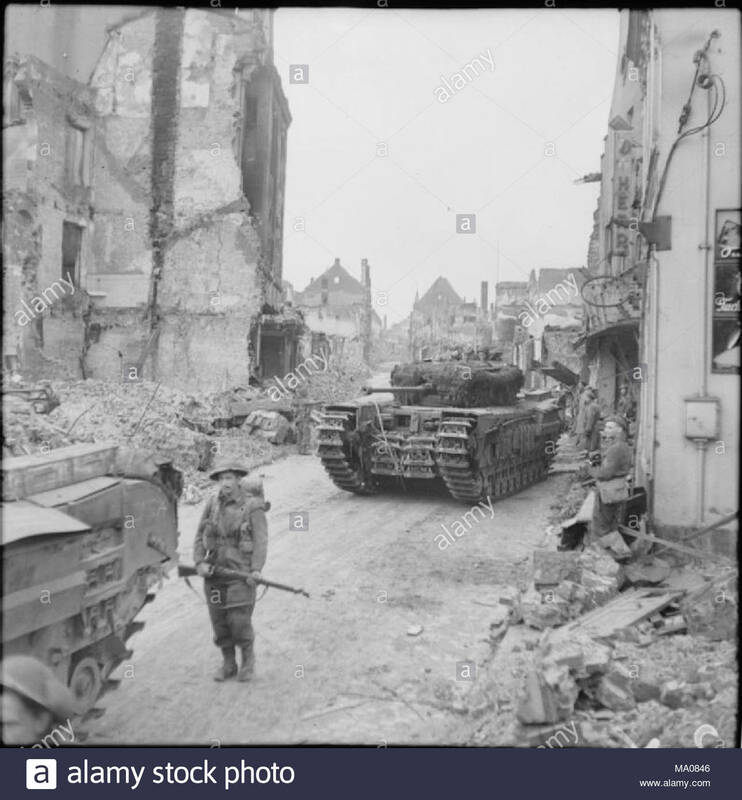 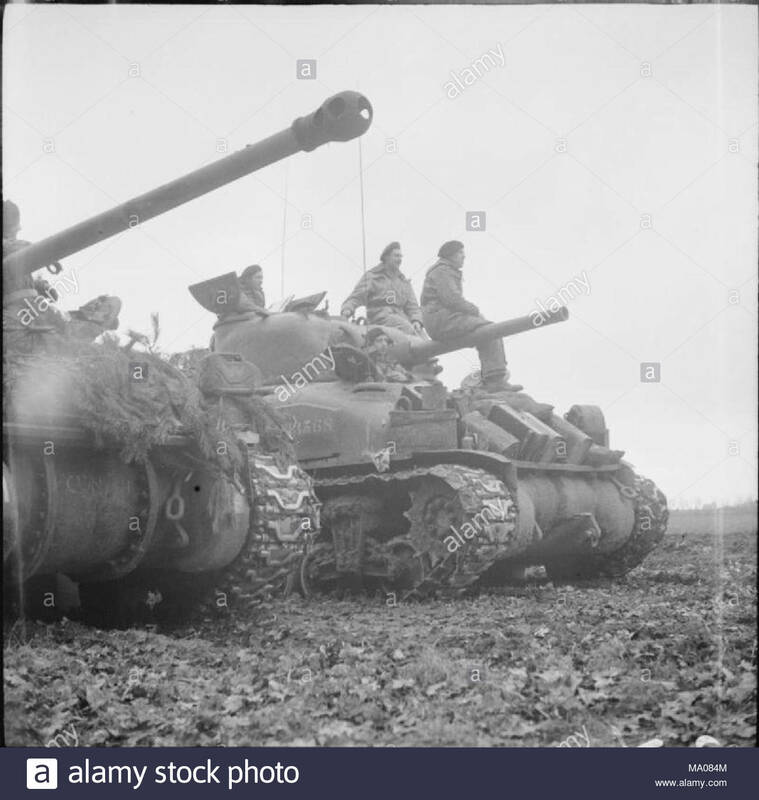 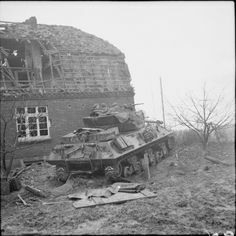 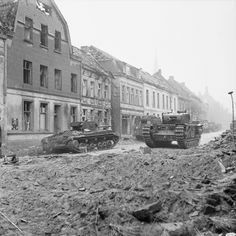 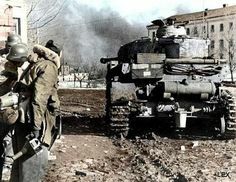 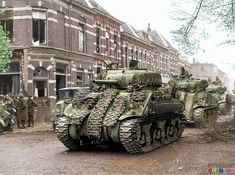 Churchill tanks of 6th Guards Tank Brigade in Dulmen, Germany, 30 March 1945 . 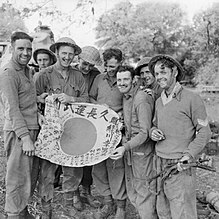 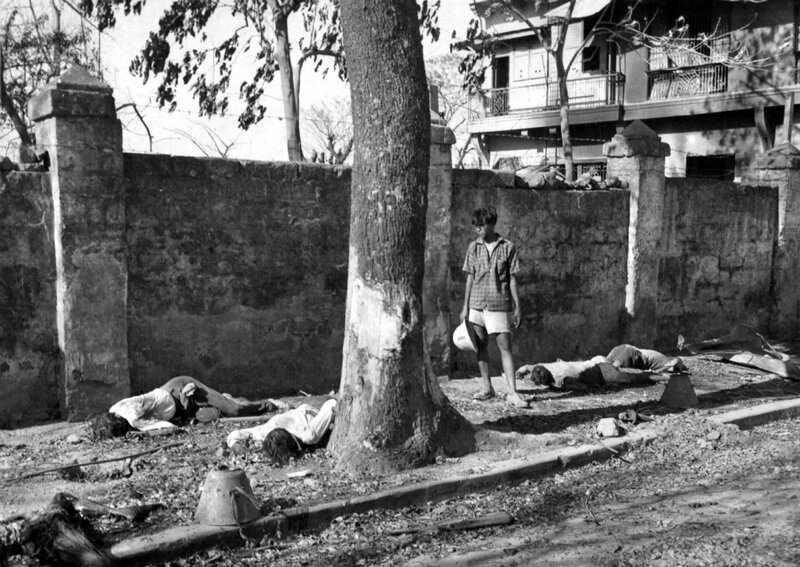 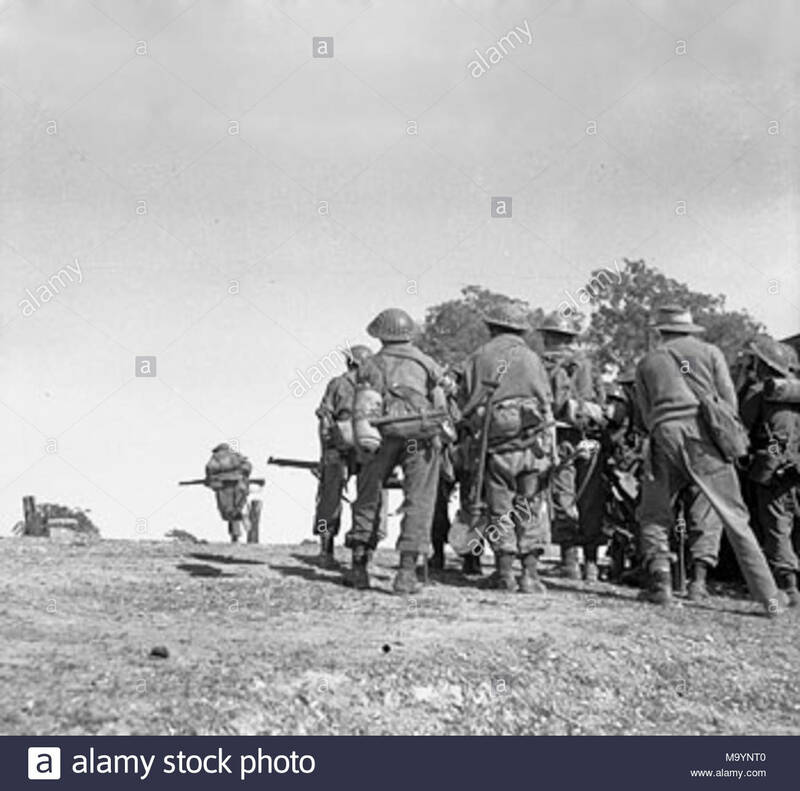 THE BRITISH ARMY IN BURMA 1945. 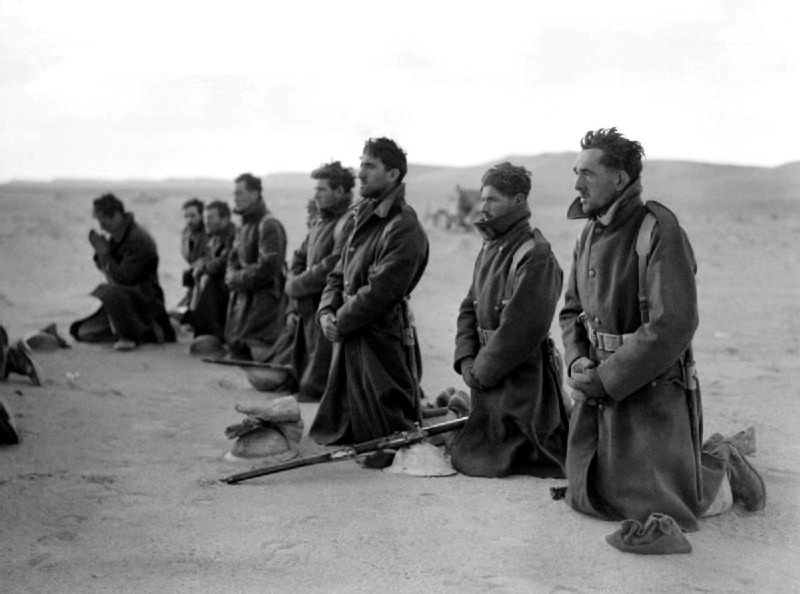 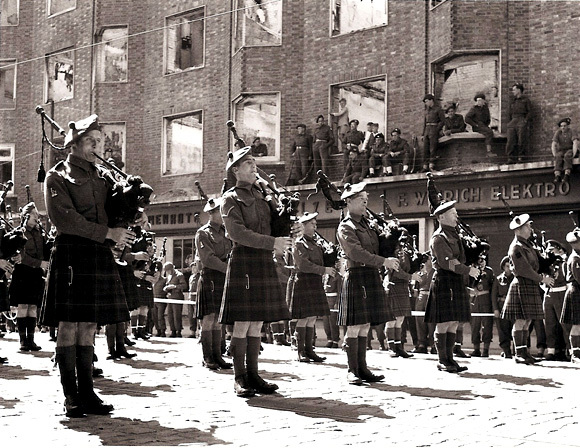 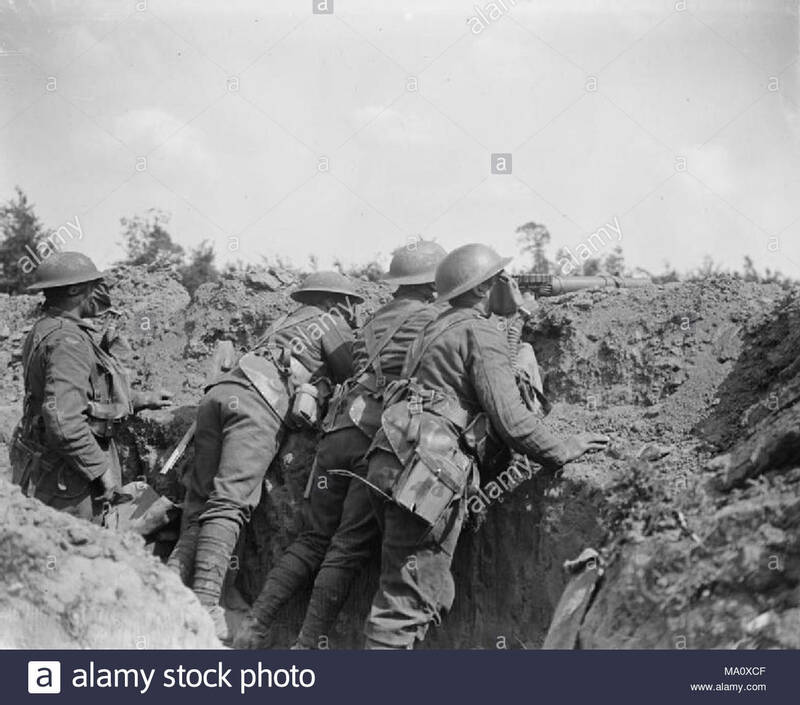 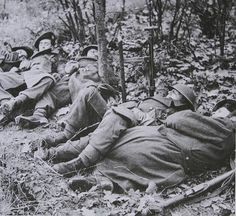 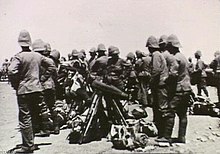 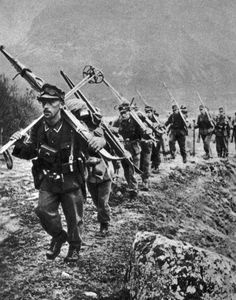 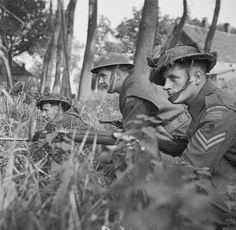 Men of the Royal Scots take up positions . 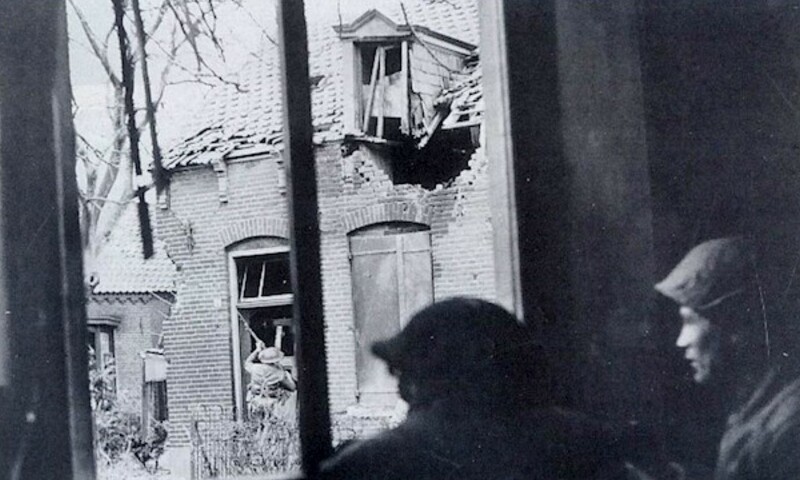 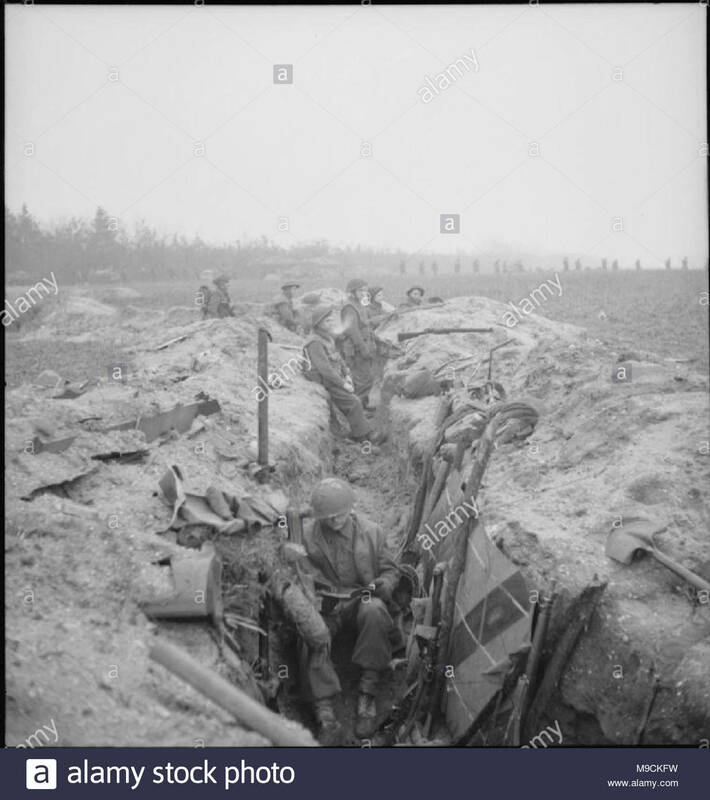 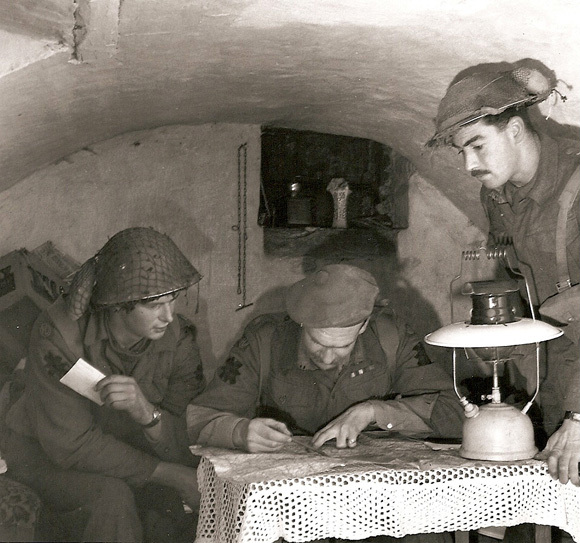 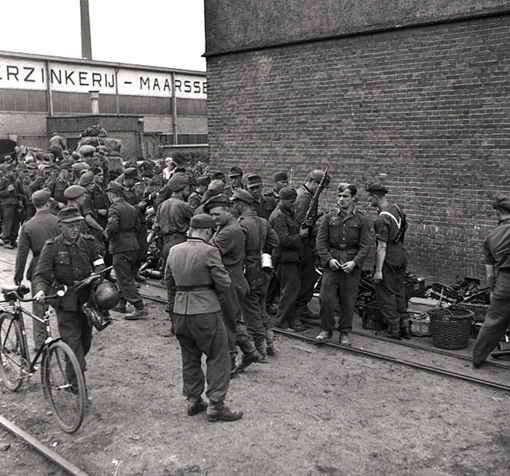 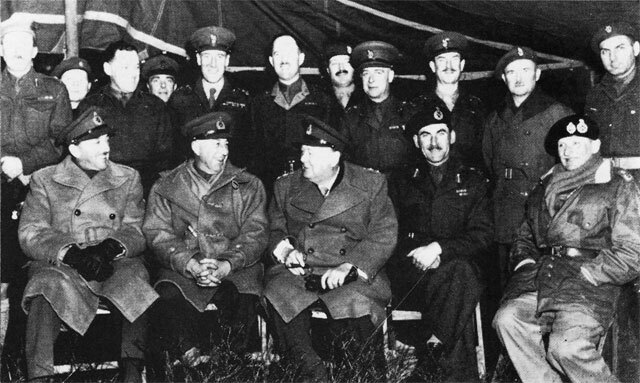 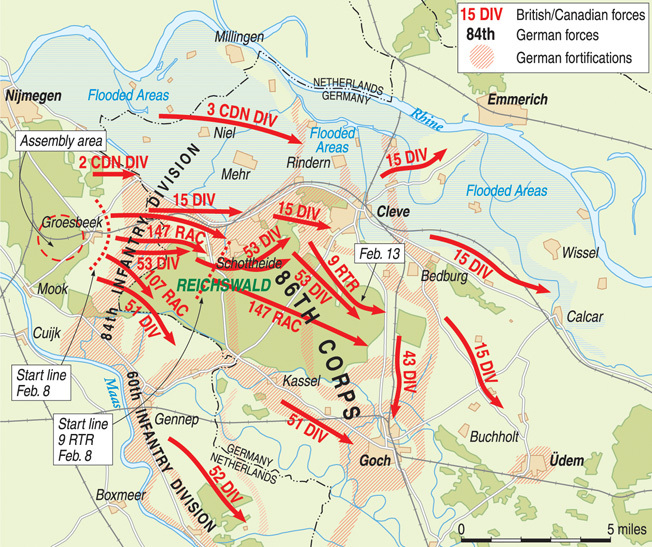 British underground HQ in Gennep 14 February 1945. 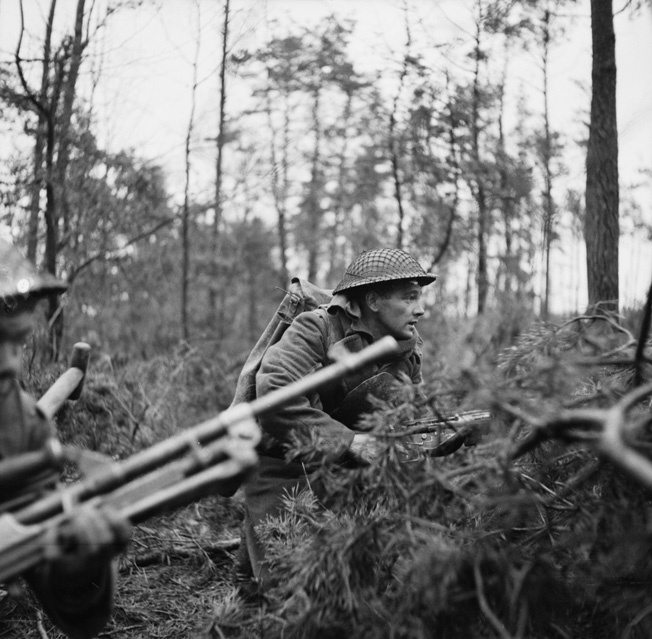 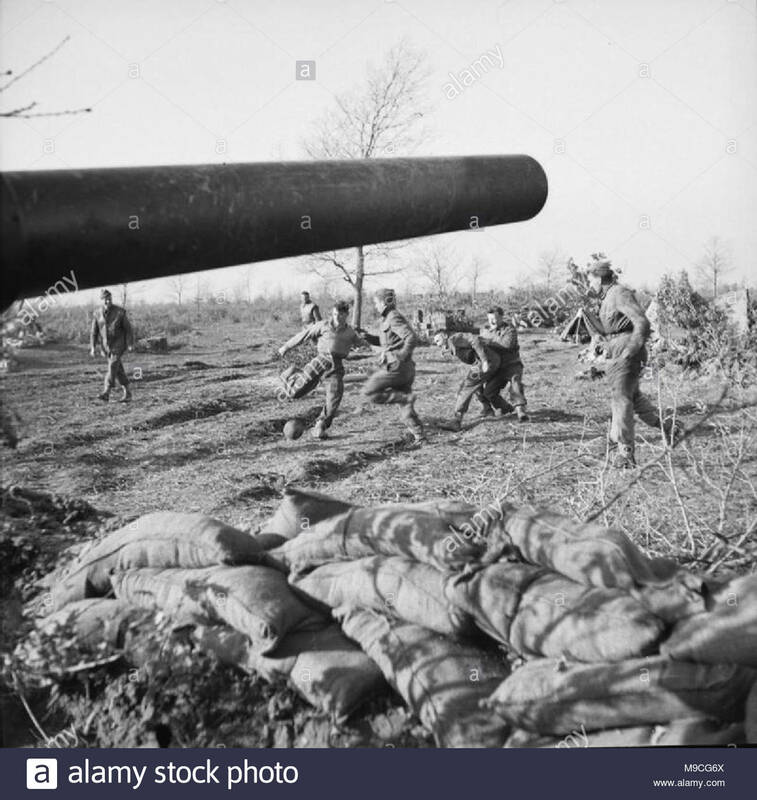 Men of the 11th Battalion, Royal Scots Fusiliers charge with fixed bayonets through 'artillery fire' at a battle school in Scotland, 20 December 1943. 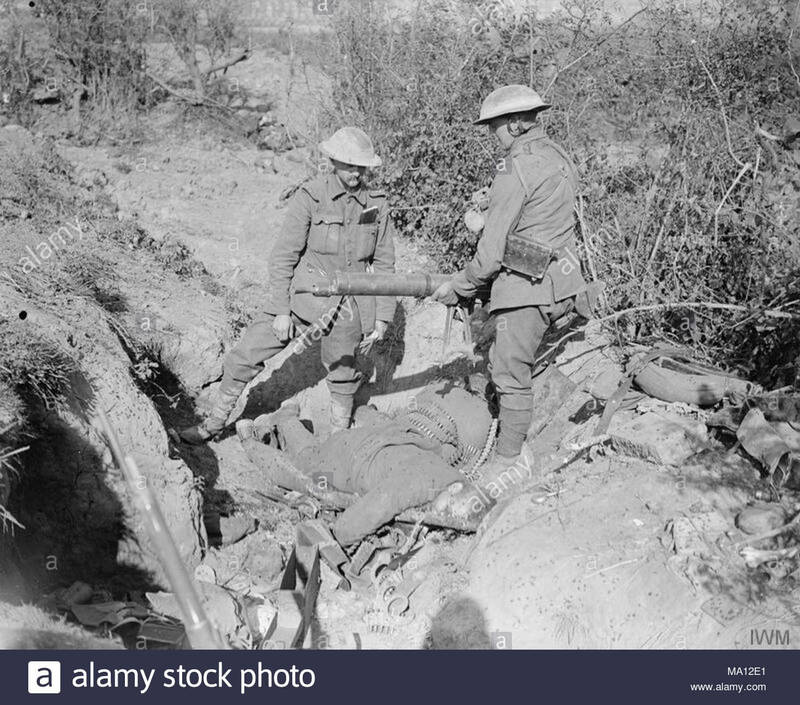 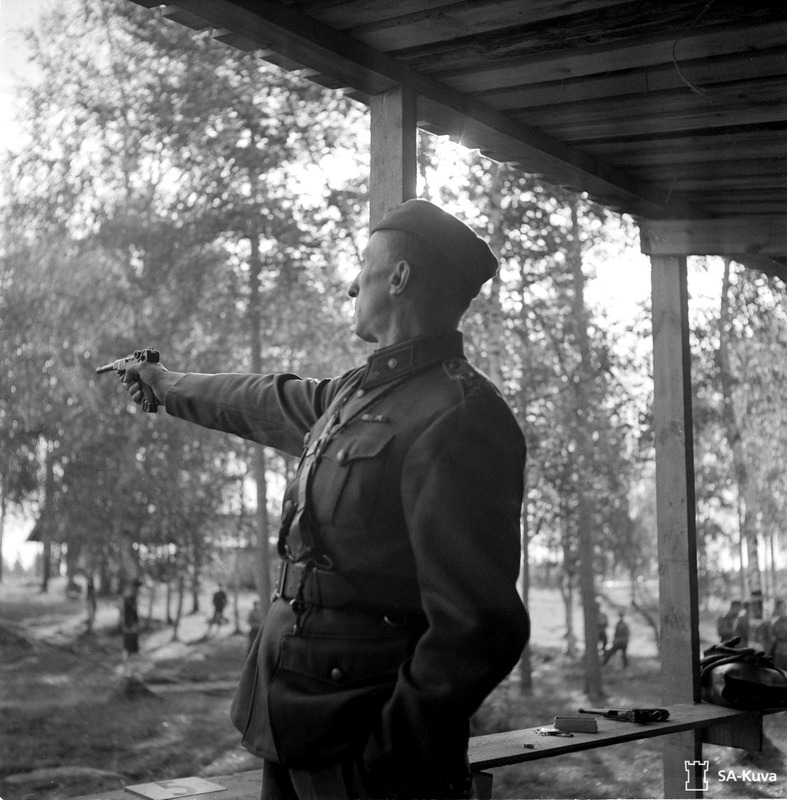 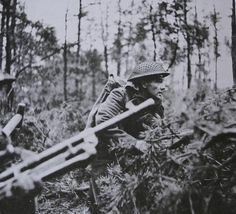 A British sergeant instructor of the Royal Scots Fusiliers trains a recruit on how to fire the SMLE Mk III Lee–Enfield in prone position, 31 August 1942. 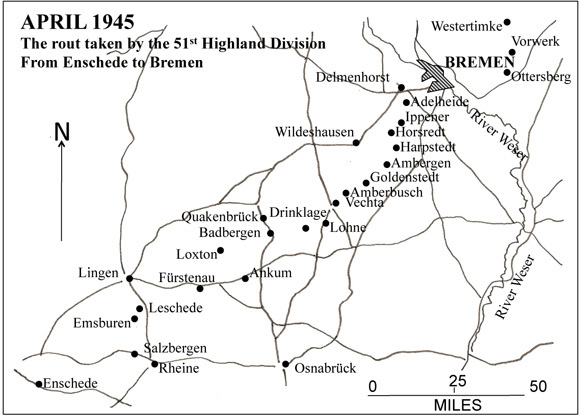 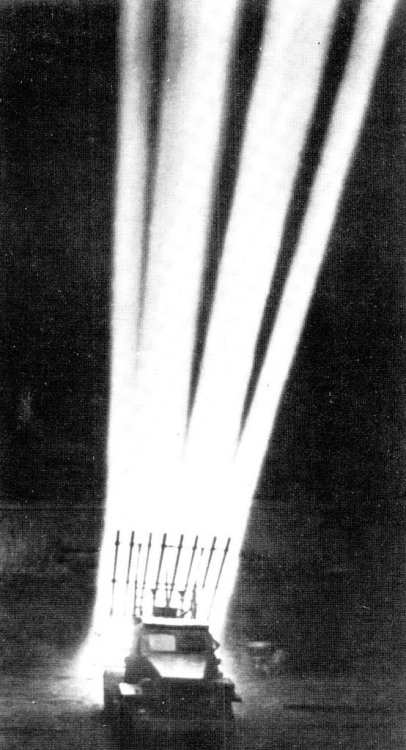 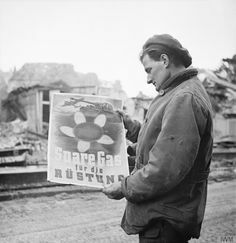 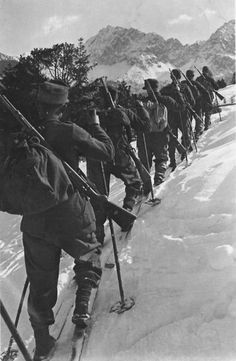 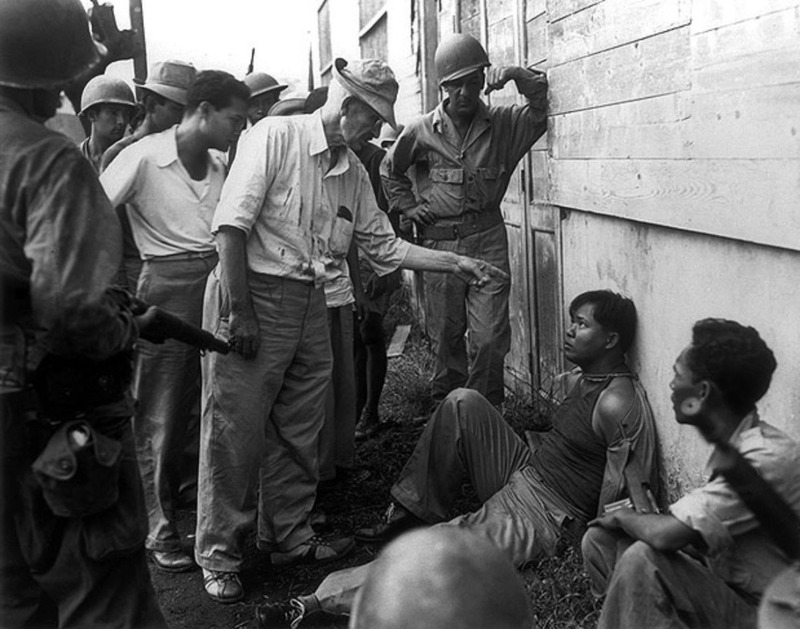 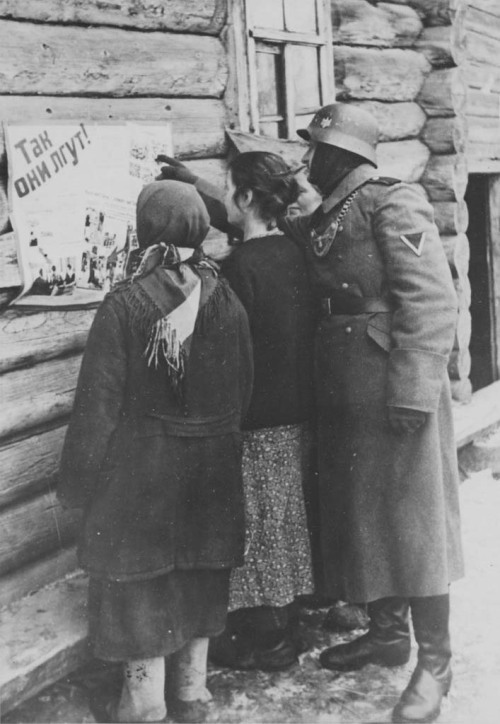 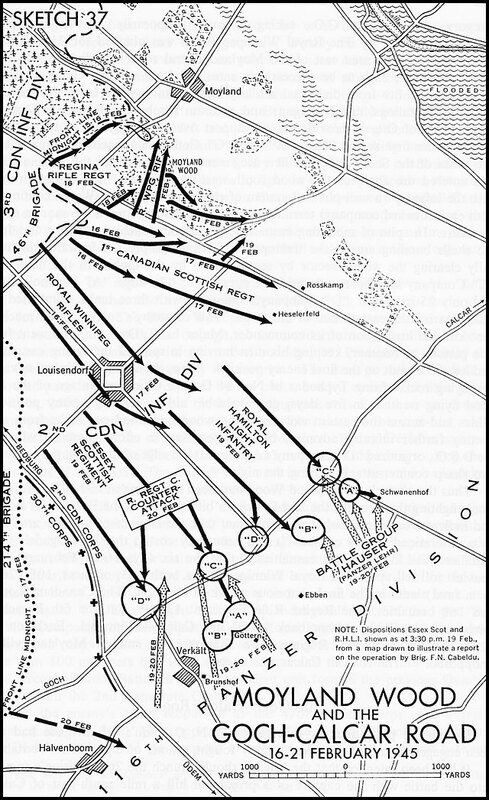 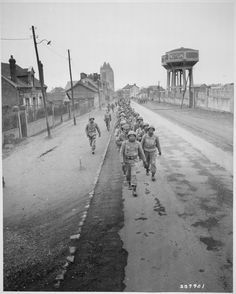 ... WWII - Page 286. 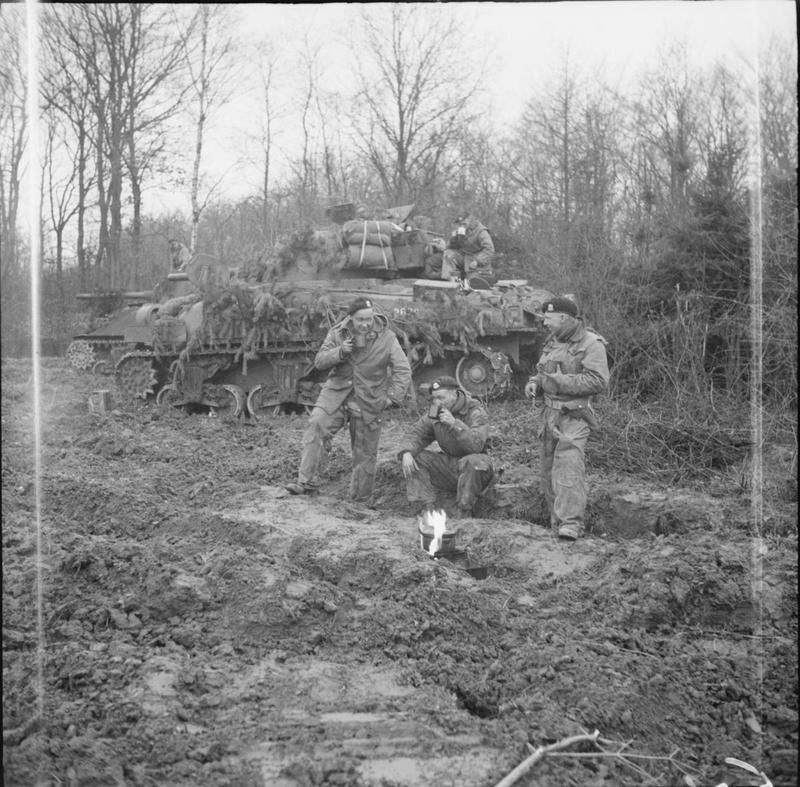 A Sherman tank crew of the Royal Scots Greys, 4th Armoured Brigade, enjoy a brew before the attack east of Goch, 27 February 1945. 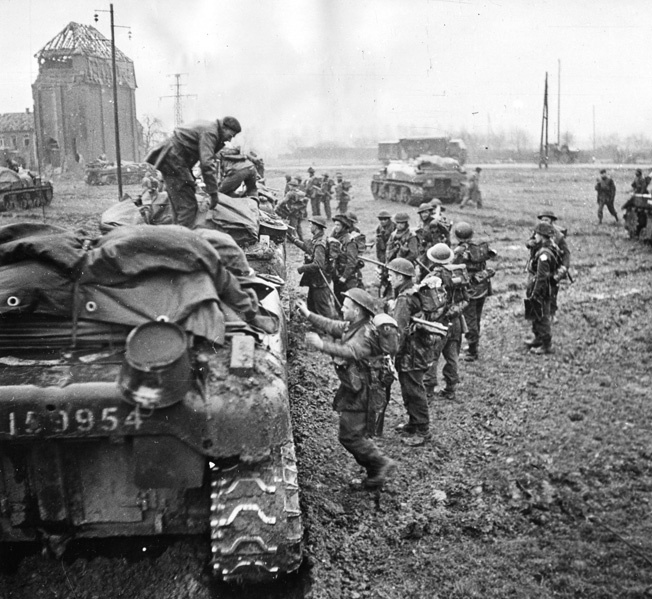 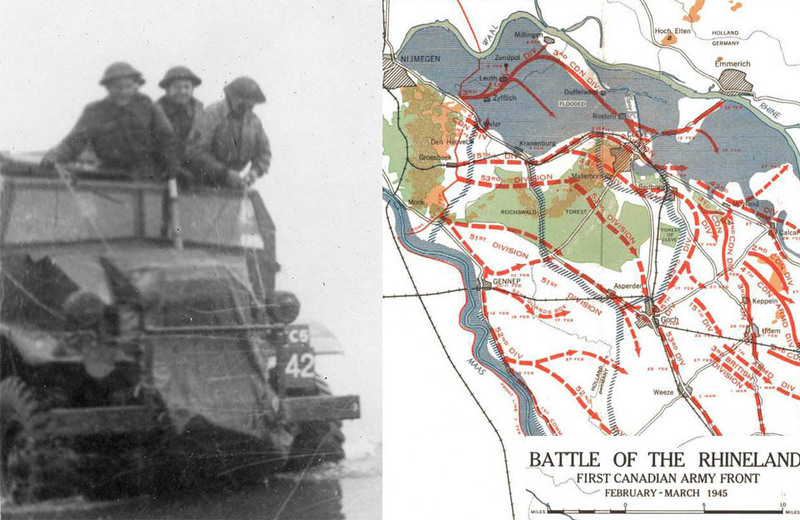 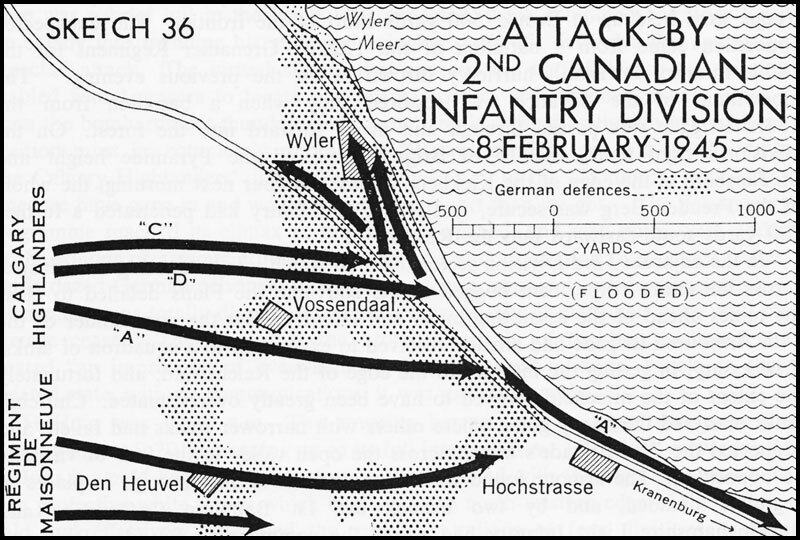 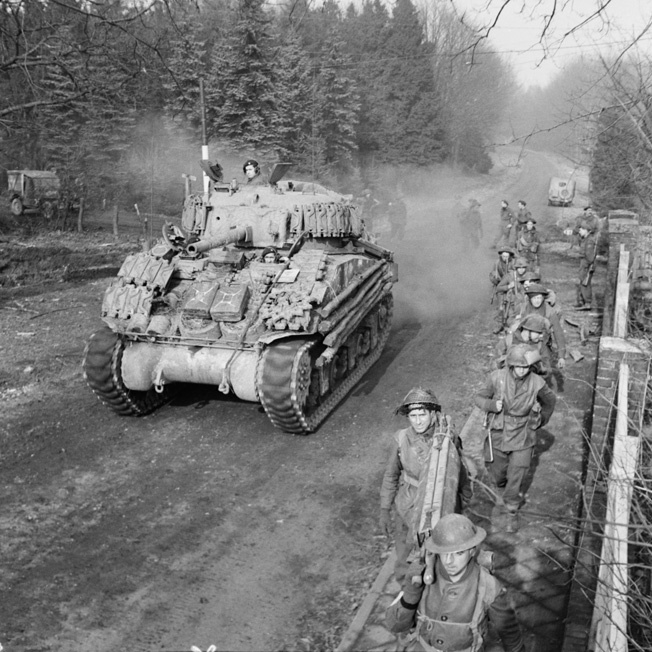 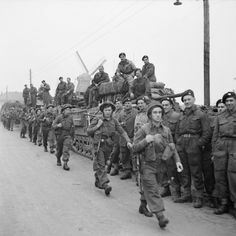 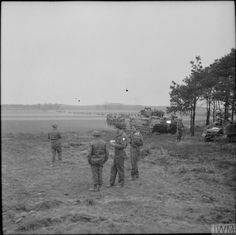 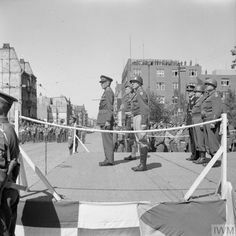 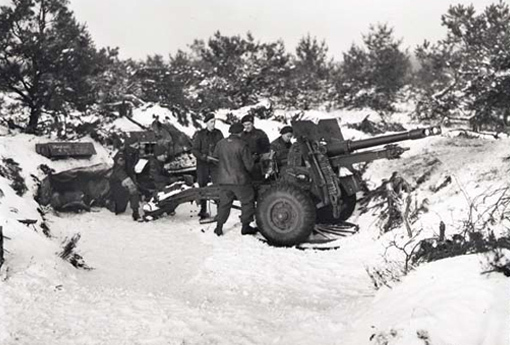 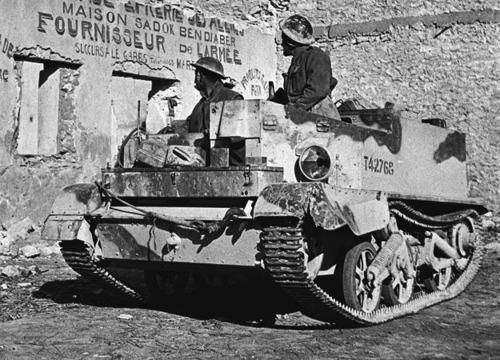 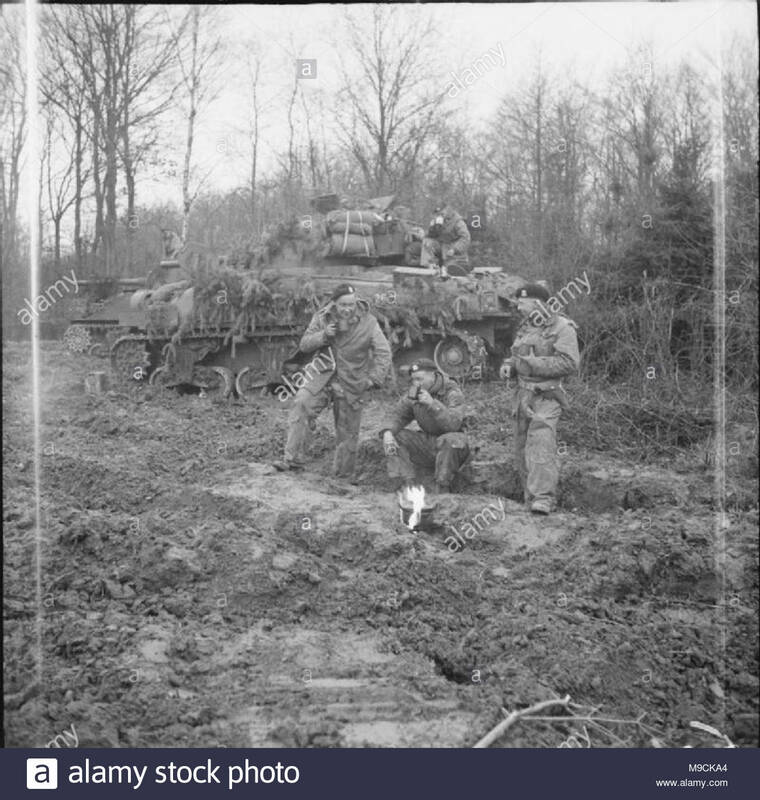 ... Armoured Regiment (Fort Garry Horse) with infantry of the Royal Regiment of Canada massing in preparation for the assault on Goch, 17 February 1945. 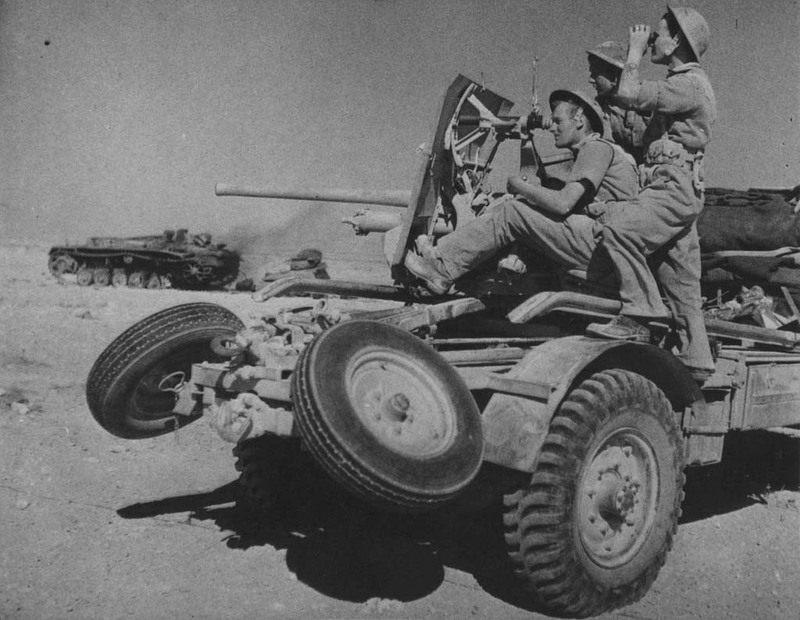 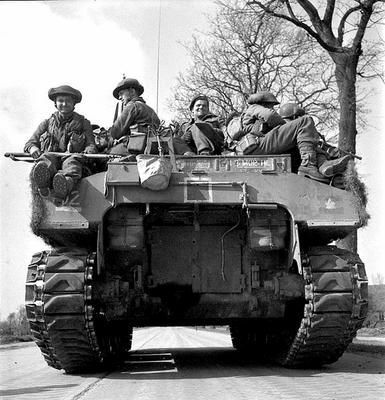 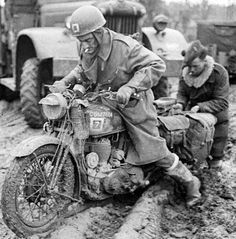 Men of the 2nd Canadian Infantry Division hitch a ride on a Canadian "Ram Kangaroo" on the way to Groningen, Netherlands, April 1945. 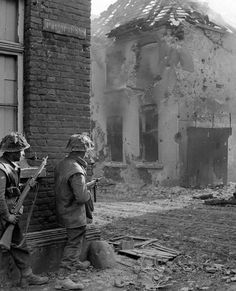 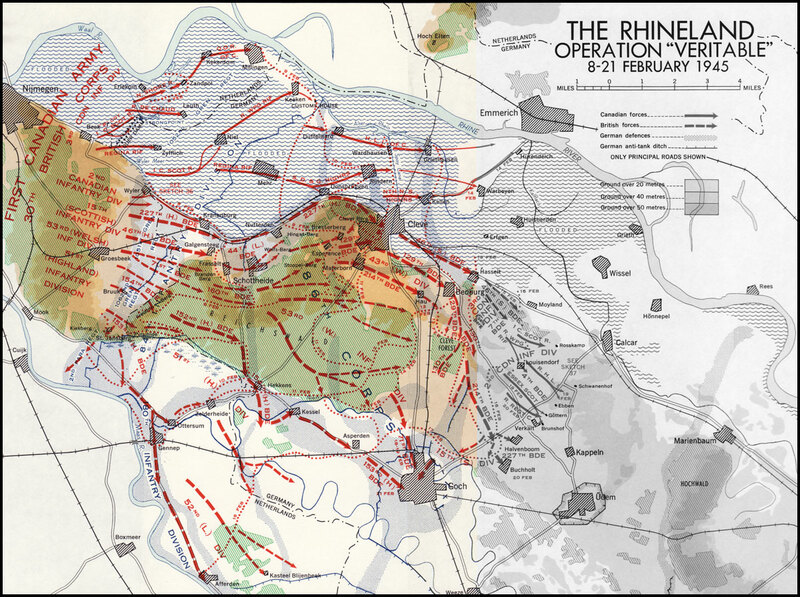 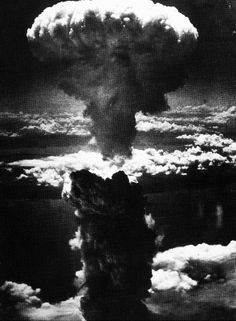 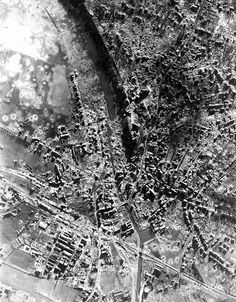 ... WWII - Page 253. 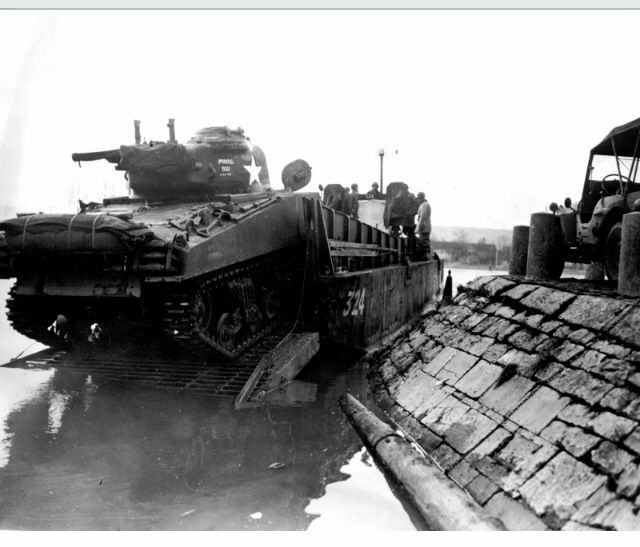 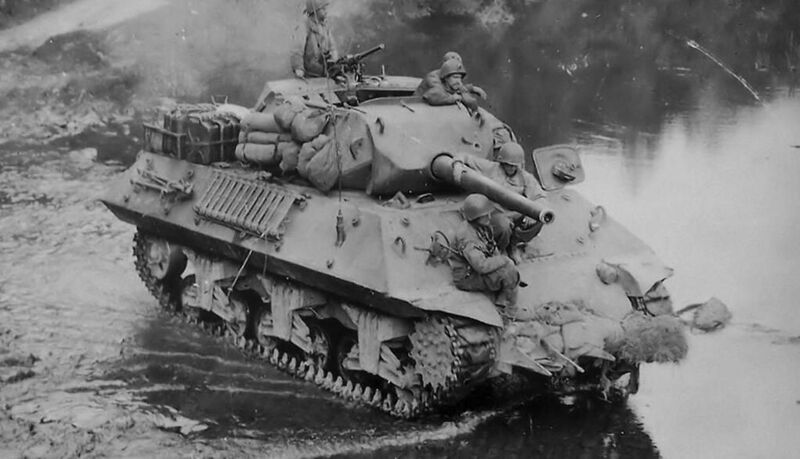 A Sherman tank hitching a ride on a Higgins boat. 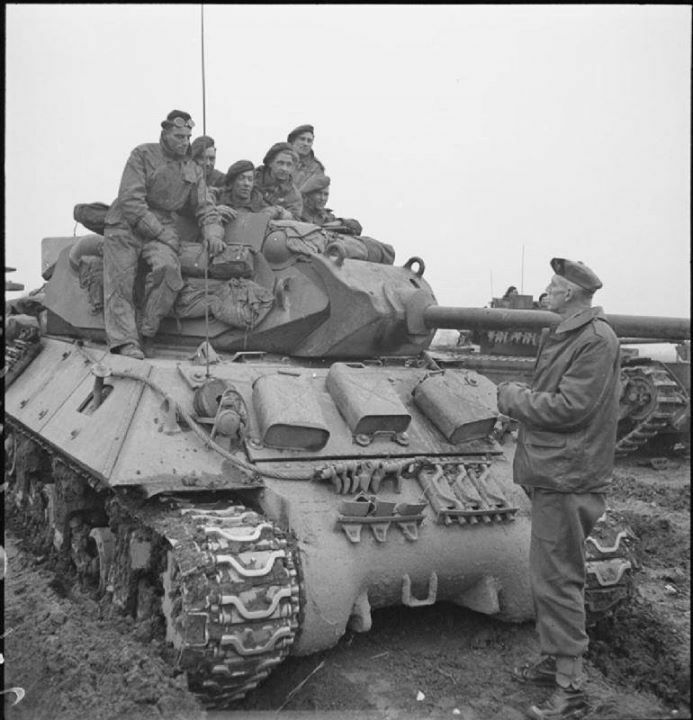 Corporal Harold Archer taken in 1946 when he was 23 years old. 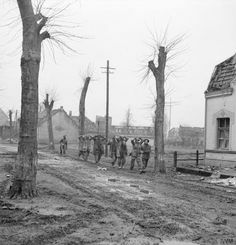 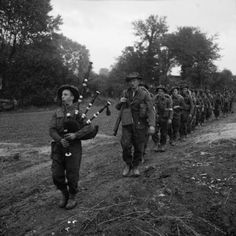 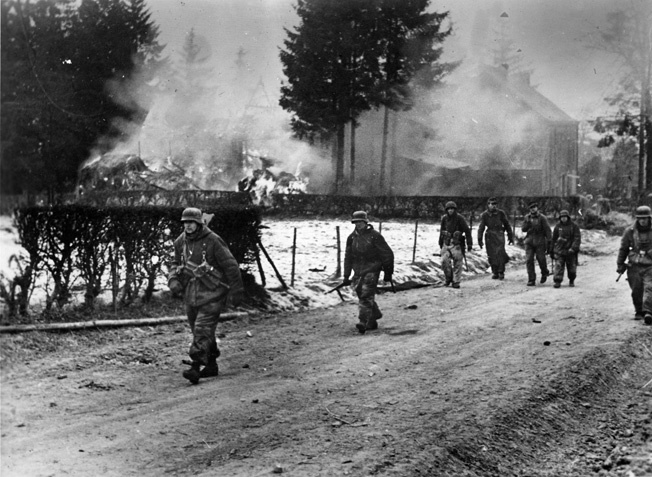 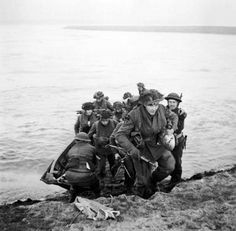 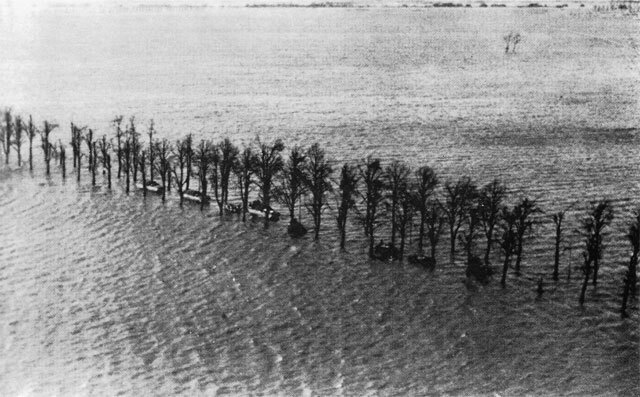 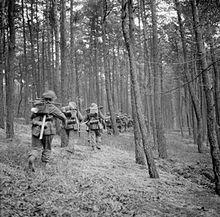 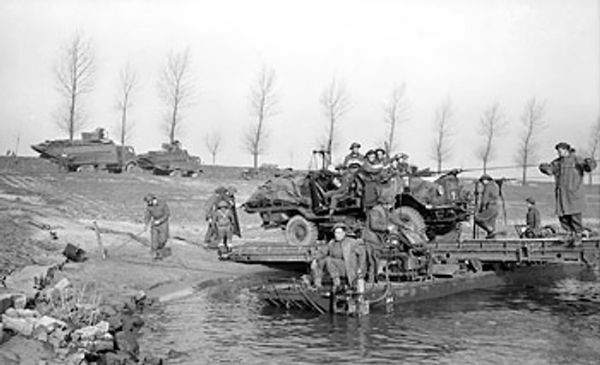 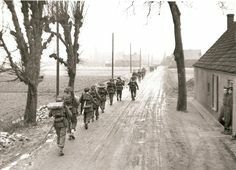 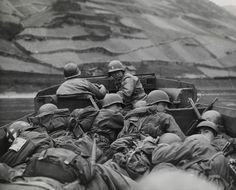 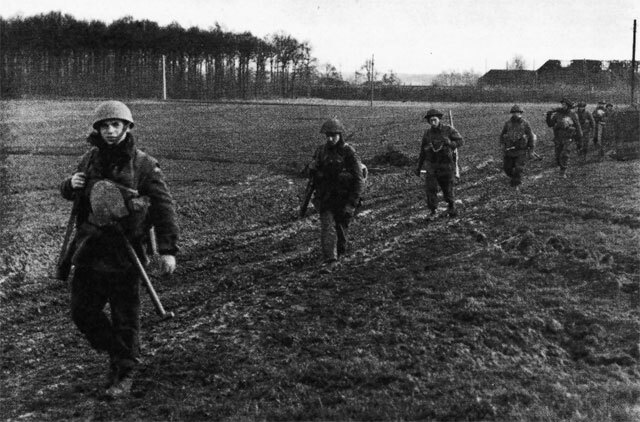 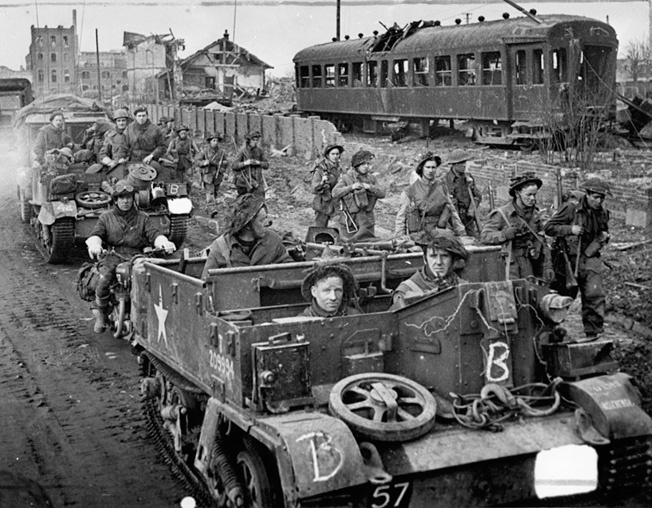 Men of the Scottish Division leave their assault craft after crossing the Rhine and double up the east bank to their assembly point near Xanten.